CAIROLI AND JONASS RACE TO REDSAND VICTORIES. The 2018 MXGP of La Comunitat Valenciana is one for the record books at the Redsand circuit in Spain’s Valencia region. 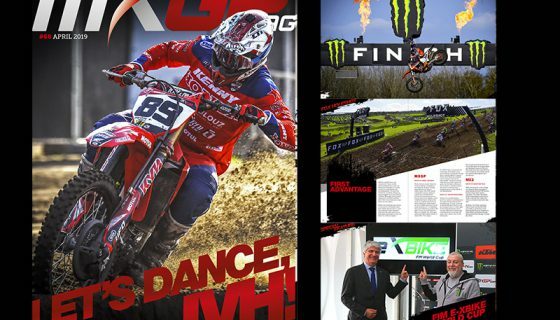 Hosting its first ever MXGP event the vibrant soil of Redsand gave MXGP fans another weekend of epic racing! 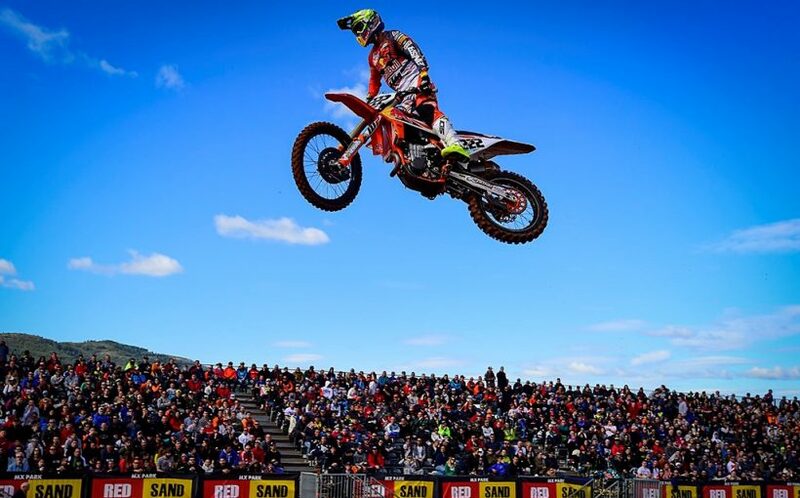 Winning his first MXGP overall and red plate of the 2018 season was the veteran and defending FIM Motocross World Champion, Red Bull KTM Factory Racing’s Antonio Cairoli. In the MX2 class it was another perfect weekend for the defending MX2 FIM Motocross World Champion, Red Bull KTM Factory Racing’s Pauls Jonass. 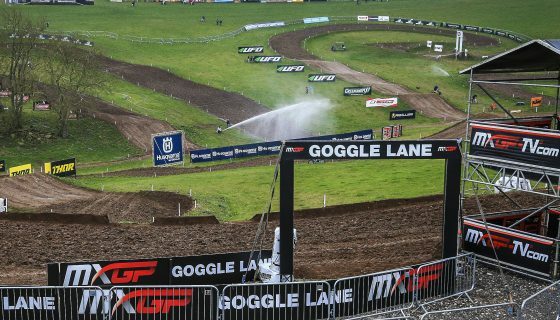 At the drop of the gate for MXGP’s Race 1 the thousands of fans in attendance were on their feet from the grand stands. Monster Energy Yamaha Factory MXGP’s Romain Febvre ignited the Fox Holeshot flames as he charged through the first corner. Just behind the former MXGP Champion from France was Italy’s Red Bull KTM Factory Racing’s Antonio Cairoli. Monster Energy Kawasaki Factory Racing’s Clement Desalle followed Team HRC’s Tim Gajser on the first lap but on lap 2 Desalle took third away. However it wasn’t just Desalle taking advantage as Wilvo Yamaha Official MXGP’s Jeremy Seewer and Red Bull KTM Factory Racing’s Jeffrey Herlings also took positions from the Slovenian on lap 2. 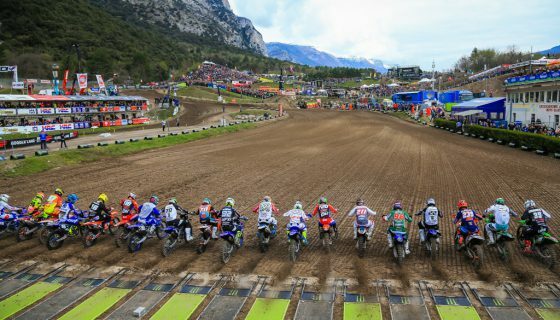 For seven laps Febvre led the field of MXGP riders until Cairoli finally made a move for the lead. Meanwhile Jeffrey Herlings had found his way into 4th past Seewer and only 1 lap after Cairoli took the lead, Herlings took 3rd from Desalle. The second half of the race Herlings was in full attack mode even gaining 2 seconds on both Cairoli and Febvre in a single lap. It wasn’t until lap 14 of 18 that Herlings found a way past Febvre. Taking the win was Cairoli as Herlings finished 4.6 seconds later followed by Febvre and Desalle. A few positions back Gajser passed Seewer along with Lieber in what was a 3 way battle for 5th. At the finish Lieber took the final spot in the top five while Seewer finished 6th and Gajser 8th, who crashed on the final lap, split by Rockstar Energy Husqvarna Factory Racing’s Gautier Paulin. Race 2 started with a FOX Holeshot from Cairoli but Paulin took the lead from the race 1 winner before the end of the first official lap. Desalle was off to another good start in 3rd along with Gajser in 4th. The #84 of Herlings was left picking up his bike after falling on the opening lap. At the conclusion of the first complete lap Herlings was in 9th position behind Marchetti Racing Team KTM’s Jose Butron. By lap 4 Herlings made his way past Butron, Monster Energy Yamaha Factory MXGP’s Jeremy Van Horebeek, his Red Bull KTM Factory Racing Teammate Glenn Coldenhoff, and Tim Gajser. One lap later Cairoli reclaimed the lead from Paulin while Desalle and Febvre had a massive bar banging battle for 3rd. Febvre at one point made a pass on Desalle but an immediate retaliation from the Belgian pushed Febvre into the grasp of Herlings. Herlings passed Febvre on lap 7 and Desalle on the following, five laps later Paulin was also moved back by the “Bullet”. In the final 6 laps Herlings tried to close on Cairoli but just as in race 1 it was too little too late. Cairoli took the win 1.8 second ahead of Herlings while Paulin was another 21.6 second behind in third. The overall win clearly went to Cairoli with his 1-1 finishes ahead of Herlings 2-2 and Desalle’s 4-4. Cairoli assumes the red plate from Herlings, though both are tied in race wins and points Cairoli has an upper hand with the most recent race win to his name. MXGP Race 1 Top Ten: 1. Antonio Cairoli (ITA, KTM), 34:52.260; 2. Jeffrey Herlings (NED, KTM), +0:04.693; 3. Romain Febvre (FRA, Yamaha), +0:12.061; 4. Clement Desalle (BEL, Kawasaki), +0:14.076; 5. Julien Lieber (BEL, Kawasaki), +0:25.080; 6. Jeremy Seewer (SUI, Yamaha), +0:26.294; 7. Gautier Paulin (FRA, Husqvarna), +0:35.890; 8. Tim Gajser (SLO, Honda), +0:41.653; 9. Maximilian Nagl (GER, TM), +0:47.206; 10. Jeremy Van Horebeek (BEL, Yamaha), +0:53.029. MXGP Race 2 Top Ten: 1. Antonio Cairoli (ITA, KTM), 34:23.638; 2. Jeffrey Herlings (NED, KTM), +0:01.830; 3. Gautier Paulin (FRA, Husqvarna), +0:23.498; 4. Clement Desalle (BEL, Kawasaki), +0:28.612; 5. Romain Febvre (FRA, Yamaha), +0:29.971; 6. Tim Gajser (SLO, Honda), +0:43.888; 7. Glenn Coldenhoff (NED, KTM), +0:48.158; 8. Jeremy Van Horebeek (BEL, Yamaha), +0:50.046; 9. Julien Lieber (BEL, Kawasaki), +0:57.229; 10. Arminas Jasikonis (LTU, Honda), +1:15.708. MXGP Overall Top Ten: 1. Antonio Cairoli (ITA, KTM), 50 points; 2. Jeffrey Herlings (NED, KTM), 44 p.; 3. Clement Desalle (BEL, KAW), 36 p.; 4. Romain Febvre (FRA, YAM), 36 p.; 5. Gautier Paulin (FRA, HUS), 34 p.; 6. Tim Gajser (SLO, HON), 28 p.; 7. Julien Lieber (BEL, KAW), 28 p.; 8. Glenn Coldenhoff (NED, KTM), 24 p.; 9. Jeremy Van Horebeek (BEL, YAM), 24 p.; 10. Maximilian Nagl (GER, TM), 22 p.
MXGP Championship Top Ten: 1. Antonio Cairoli (ITA, KTM), 141 points; 2. Jeffrey Herlings (NED, KTM), 141 p.; 3. Clement Desalle (BEL, KAW), 103 p.; 4. Romain Febvre (FRA, YAM), 101 p.; 5. Gautier Paulin (FRA, HUS), 98 p.; 6. Glenn Coldenhoff (NED, KTM), 79 p.; 7. Jeremy Van Horebeek (BEL, YAM), 78 p.; 8. Maximilian Nagl (GER, TM), 60 p.; 9. Jeremy Seewer (SUI, YAM), 59 p.; 10. Julien Lieber (BEL, KAW), 54 p.
MXGP Manufacturers: 1. KTM, 150 points; 2. Yamaha, 108 p.; 3. Kawasaki, 103 p.; 4. Husqvarna, 102 p.; 5. Honda, 63 p.; 6. TM, 60 p.; 7. Suzuki, 30 p.
While the MXGP class is full of biggest stars in World Motocross the local fans were cheering the loudest during the MX2 class. The Red Bull KTM Factory Racing Pauls Jonass was the winner but his young teammate from Spain, Jorge Prado, was the focus of the fans. Race 1 started with a FOX Holeshot from STC Racing Husqvarna’s Henry Jacobi who barely surpassed Hitachi KTM UK’s Conrad Mewse to the chalk. Right behind the pair was Jonass who quickly took over the lead. Prado had a good start as well in 4th after the first lap just ahead of Honda 114 Motorsport’s Hunter Lawrence. TM Factory Racing’s Samuele Bernardini passed Lawrence for 5th on lap 2 and 2 laps later both himself and Lawrence overtook Jacobi. Lawrence also moved into 4th ahead of Bernardini in the process. Rockstar Energy Husqvarna Factory Racing’s Thomas Kjer Olsen was next to take a spot from the TM rider and five laps later Olsen would do the same to Lawrence. With Olsen pressuring Prado both the Spaniard and Dane found the speed to pass Mewse for second only two laps before the finish. At the line Jonass won with Prado, Olsen, Mewse, and Lawrence rounding out the top 5. Race 2 started with a Fox Holeshot from the local superstar but again Jonass took the lead nearly instantly. Olsen had a much improved start for race 2 and also passed Prado before the first lap was complete. Bike IT DRT Kawasaki’s Darian Sanayei was fast all weekend and after coming from 13th to finish 6th in race 1 the American started race 2 in 4th after lap 1 with Lawrence behind him. In the 8 laps of race 2 the top seven remained the same but on lap 9 a mistake from Olsen and pass from Sanayei on Prado put Sanayei second and Olsen 5th with Prado and Lawrence between them. After 3 more laps Olsen had refocused and passed Lawrence for 4th. In the remaining 7 laps again no position changes occurred in the top 6 but Sanayei made several attempts at the lead. At the finish Jonass won his 6th race of 6 this year for his 3rd overall victory, with Sanayei, Prado, Olsen, and Lawrence finishing the top 5. In the overall standings Jonass scored the perfect 50 points ahead of Prado with 42 and Olsen with 38 for his 3rd podium of 2018. MX2 Overall Top Ten: 1. 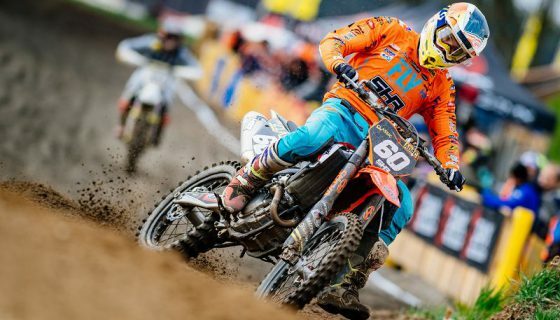 Pauls Jonass (LAT, KTM), 50 points; 2. Jorge Prado (ESP, KTM), 42 p.; 3. Thomas Kjer Olsen (DEN, HUS), 38 p.; 4. Darian Sanayei (USA, KAW), 37 p.; 5. Hunter Lawrence (AUS, HON), 32 p.; 6. Conrad Mewse (GBR, KTM), 30 p.; 7. Jed Beaton (AUS, KAW), 28 p.; 8. Calvin Vlaanderen (RSA, HON), 28 p.; 9. Ben Watson (GBR, YAM), 20 p.; 10. 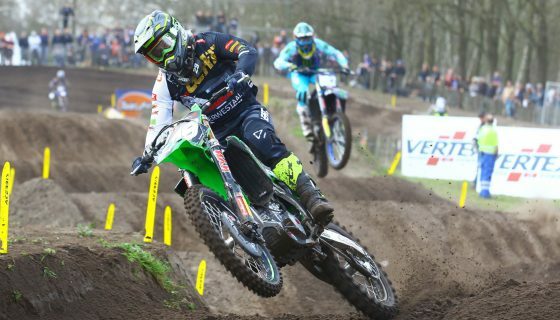 Bas Vaessen (NED, HON), 20 p.
MX2 Championship Top Ten: 1. 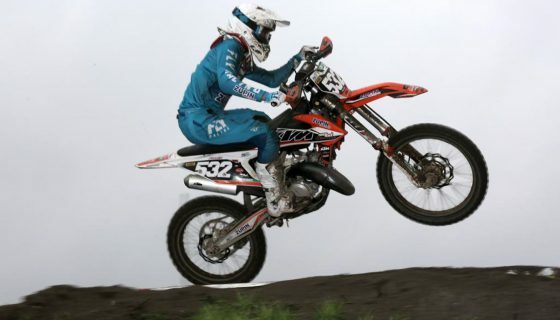 Pauls Jonass (LAT, KTM), 150 points; 2. Thomas Kjer Olsen (DEN, HUS), 120 p.; 3. Jorge Prado (ESP, KTM), 105 p.; 4. Hunter Lawrence (AUS, HON), 99 p.; 5. Conrad Mewse (GBR, KTM), 81 p.; 6. Ben Watson (GBR, YAM), 81 p.; 7. Jed Beaton (AUS, KAW), 72 p.; 8. Darian Sanayei (USA, KAW), 68 p.; 9. Calvin Vlaanderen (RSA, HON), 63 p.; 10. Vsevolod Brylyakov (RUS, YAM), 54 p.
MX2 Manufacturers: 1. KTM, 150 points; 2. Husqvarna, 120 p.; 3. Honda, 100 p.; 4. Kawasaki, 97 p.; 5. Yamaha, 89 p.; 6. TM, 28 p.